A painful, stiff knee can keep you from doing the simple things in life, even walking without pain. 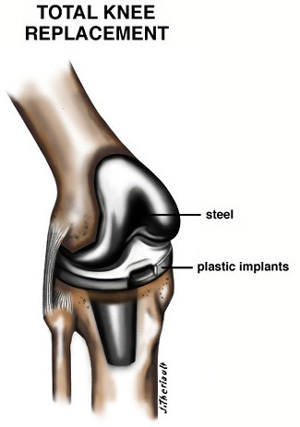 Due to the latest technology, surgical techniques and materials of today, your physician can replace your problem knee. Rheumatoid arthritis is a disease in which there is thickening and inflammation of the synovial membrane. Over time this chronic infammation can cause cartilage damage, leading to pain and stiffness. 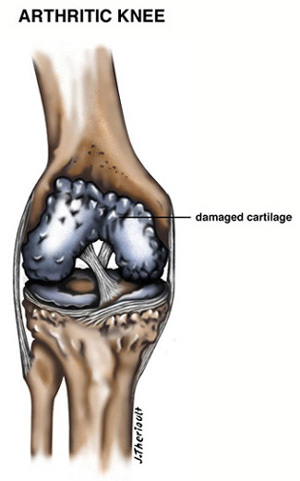 You can only walk without pain when the bones in your knee joint are smooth and cushioned by healthy cartilage. 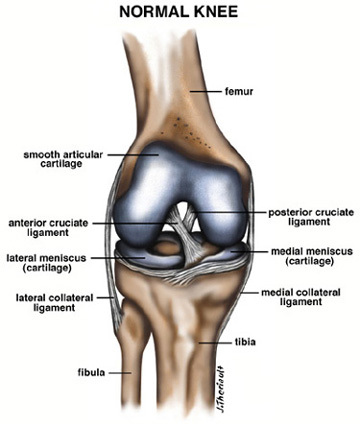 You also need strong muscles and ligaments for stability, because your knee is more than a simple hinge joint. Each time you bend your leg to walk or climb stairs, the bones rotate, roll, and glide on each other. Like a normal knee, your prosthesis has smooth weight-bearing surfaces. The femoral component covers your thigh bone, the tibial component covers the top of your shin bone, and the patellar component covers the underside of your kneecap. Your orthopaedic evaluation helps your physician to determine if you are a candidate for a total knee replacement. After your evaluation, our team will discuss whether total knee replacement is the best treatment for you at this time. Once you have decided to proceed with your total knee replacement, the team will review pre-op instructions with you. Traditionally, patients remain hospitalized for 24 to 48 hours. In recent years, research has shown improved outcomes for patients with even shorter stays and many times total knee replacments can even be performed on an outpatient basis, allowing patients to return home the same day. After surgery, you may wake up feeling a bit groggy. Specially trained nurses will be with you to keep you comfortable and provide pain medications. Your nurses also coach you with coughing and deep breathing exercises to help clear your lungs and prevent post-operative complications. You will have a dressing on your knee with a drain for normal post-operative bleeding. Once you are awake and alert, you will be transferred to your hospital room or in the case of outpatient surgery, sent home with your caregiver. Once the surgery is over, the goal is to begin walking again as soon as possible. You will be started on a physical therapy program to exercise your knee muscles and regain strength and range of motion in your new knee. These exercises will also improve circulation to your leg, improving the healing process. Once home, your goal is to return safely and comfortably to your activites of daily living. You will be referred for follow up physical therapy to relieve any stiffness you may feel and will help you regain independnce as you learn to care for your new knee. Physical therapy is a vital part of recovery and will help you regain your full knee potential. Your therapist will work with you on strength exercises to tone your thigh muscles, which have the greatest control over your new knee and range of motion exercises to help you bend and straighten your knee more fully. After a total knee replacement, you can look forward to less knee pain, stiffness, and deformity in your leg. With your new knee you can expect to enjoy your activities of daily living with greater ease and comfort. You can once again enjoy life more fully with a more independent and mobile lifestyle getting you back once again to the life you love.